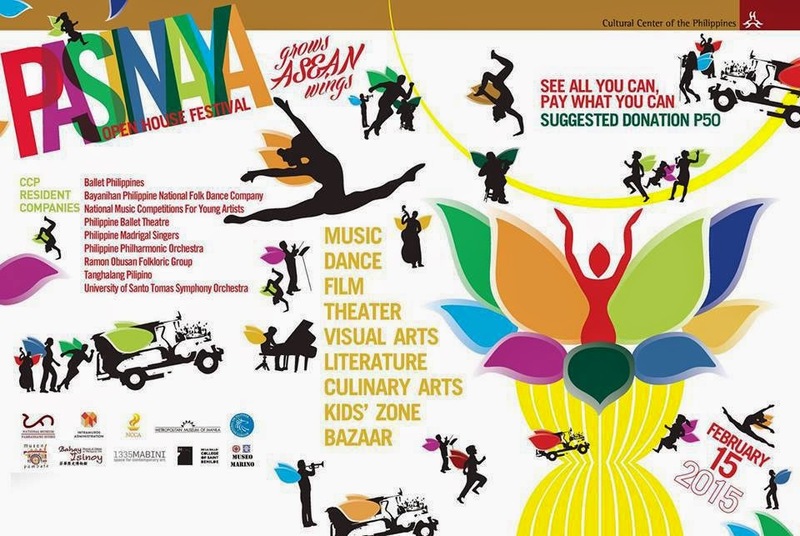 The CCP is proud to announce its 11th Pasinaya: CCP Open House Festival, the largest multi-arts festival in the country, on February 15, 2015, showcasing more than 3,000 artists and 300 shows, from 7:00 a.m. to 7:00 p.m. in all CCP performance venues. The public will once again be treated to previews of the forthcoming season productions of the CCP and its resident companies such as Ballet Philippines, Bayanihan Philippine National Folk Dance Company, National Music Competitions for Young Artists (NAMCYA), UST Symphony Orchestra, Philippine Ballet Theatre, Philippine Madrigal Singers, Philippine Philharmonic Orchestra, Ramon Obusan Folkloric Group, Tanghalang Pilipino and the UST Symphony Orchestra. Aside from performances by guest artists in dance, music and theater, there will be art exhibits, film showings, more food booths and tiangge, making the CCP the HAPPIEST PLACE ON EARTH that weekend. Once more, our partner museums will also be open to the public as audiences will be transported using the hop-on-hop-off jeepneys. Everyone is invited to attend and watch the shows for FREE. However, the festival encourages a "Pay What You Can, See All You Can" scheme. As a loyal supporter of the CCP and an avid arts and culture aficionado, we would like to invite you to attend this grand MULTI-ARTS FESTIVAL that is expected to reach 12,000 participants and 60,000 viewers this year. For only Php3,000.00, you may get a VIP Box at the CCP Main Theater (Tanghalang Nicanor Abelardo) for a group of six (6). The VIP Box which is yours for the whole duration of the festival also entitles you to use the special lane when entering the CCP Little Theater (Tanghalang Aurelio Tolentino) and CCP Studio Theater (Tanghalang Huseng Batute). 1. All entries should be submitted via bluetooth or card reader at the Pasinaya Photo Competition Booth at the CCP Little Theater Lobby on February 15 not later than 3:30 p.m.
2. Entries may be e-mailed to ccpvolunteers@gmail.com on February 15 not later than 3:30 p.m. E-mail subject should be "2015 Pasinaya Photo Essay Competition". PASINAYA FAST PASS BALLERS - Enjoy priority lane entry to all performance venues for only P300. PASINAYA VIP BOX - A dedicated Box (6 seats) at the Main Theater will be yours exclusively for whole duration of the festival for only P3,000. You can also enjoy priority lane entry to performances in Tanghalang Aurelio Tolentino and Tangjalang Huseng Batute. For inquiries, call the CCP Box Office at 832-3704 / 06 or at 832-1125 local 1405, 1409.